Introduction: There is sparse literature regarding the optimal surgical management of megaobesity, defined as body mass index (BMI) >70 kg/m2. 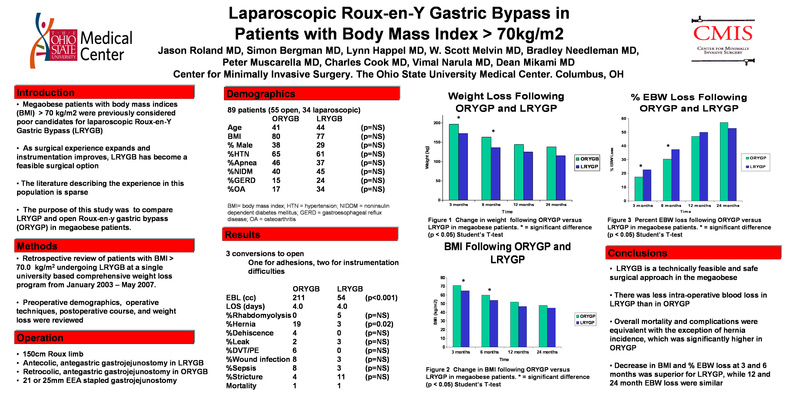 The purpose of this study was to compare laparoscopic Roux-en-y gastric bypass (LRYGP) and open Roux-en-y gastric bypass (ORYGP) in megaobese patients. Methods: A retrospective review of patients with BMI >70 kg/m2 undergoing LRYGB and ORYGP from January 2003 to May 2007 at a single university comprehensive weight loss program was carried out. We reviewed preoperative demographics, operative details, postoperative course, and weight loss.